Beseech the gods of Olympus and release the most powerful mythical creatures of ancient Greece as you claw your way to the top. A very nicely produced game set in ancient Greece complete with a panoply of mythological creatures. 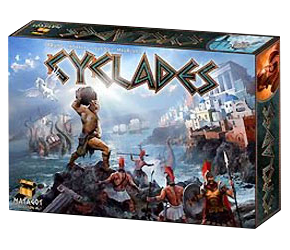 Hits that just-right mix between game mechanics and theme—and of course Cyclades finally gives you an excuse to shout “Release the Kraken!” during a game, which is never a bad thing. This rules summary and reference includes the expansions Hades, Titans, Monuments, and the C3K Cyclades/Kemet crossover pack. Any chance on an update to include the Hades Expansion? Are they in the Hades expansion, or the Kemet/Cyclades expansion? they are a sort of mini-expansion: they were given out in Essen and in the first print of the Hades expansion, and now can be bought on the BGG store: http://boardgamegeekstore.com/search?q=cyclades or on the Matagot website: http://www.matagot.com/spip.php?page=article&id_article=300&produit=122. Everyone I know that has the Hades expansion have these cards. Thanks, but I might avoid adding things like special promo cards. That would start me on a long slippery slope with all my summaries… Also, these things are expensive and tricky to get when you live on the other side of the world! For the Hades Free Positioning module, it’s not stated that first proper round has no income. Any chance of a Cyclades: Titans update? Eventually – can’t say exactly when though I’m sorry. Fantastic summaries as always. Loved your Kemet one and your recently released Fury Of Dracula summary. I always print these on a nice glossy paper and trim them down. I’ll give a +1 to a Cyclades: Titans updated summary sheet! Fantastic Expansion! I’ll be getting this game back out of storage soon, and then I’ll probably start work on updating these sheets. Gday mate, just wanted to say, fantastic rules summaries, You’ve been so much help to me and my gaming group. Just thought I’d let you know that your player summary for this one has HEPHAESTUS and HERMES written with the exact same ability. Whoops, sorry about that, fixed now. My new favourite game! Thanks for doing brilliant word on the summary. Just one minor bit of feedback: on the C3K Egyptian Reinforcements reference card, the Sphinx is represented by a repeated image of the Elephant. Looking forward to the Titans update when you get around to it! Whoops! I’ll fix that asap. Thanks for this playing aid. (1) Point 17: The free action of each god *must* be carried out, and it should be the *first* action. (2) Point 9: You cannot look at the discard pile, including before buying the Chimera. A small typo: “recruit, built, and recruit” => “recruit, build, and recruit”. Thankyou, I’ll update this. Though I think it says you can look in the discard pile when using the chimera’s power? Yes, but not before buying the Chimera. Only after you’ve paid.